The FoodieMeet Bake Off recipe calls for a large bowl. Mix up Twitter, a dash of charitable giving, plus a healthy portion of sweet-toothed Toronto food lovers and you get a delicious and social Sunday night at The Samovar Room. 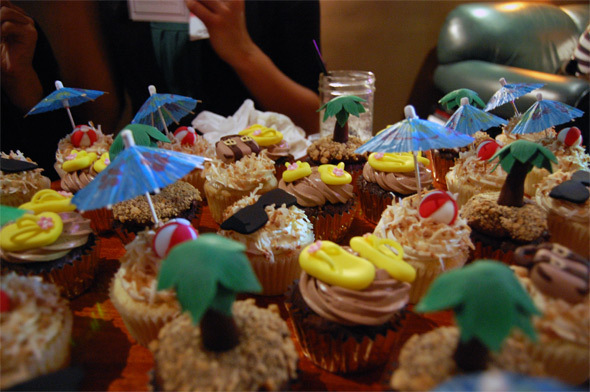 With the theme "Escape Toronto," a mix of amateur and professional bakers dreamed up tasty treats like Mayan Chocolate and Eggnog Mousse Macarons, Black Sesame & White Chocolate Wasabi Cupcakes, and Bacon Blondies. The event was judged by local cheesemaker Ruth Klahsen of Monforte Dairy, cook and food writer Ivy Knight, and CBC personality Nora Young. FoodieMeet (@foodiemeet) is a group that started on Twitter, as a way to bring Toronto foodies together one tweet and one meet at a time. It was the brainchild of Andrea Chiu (@TOfoodie) and Suresh Doss (@spotlightcity), who connected on Twitter through their mutual love of getting out and experiencing the city through food. "We had never met in real life before, but we, along with other geeky food-lovers had been discussing food for months on Twitter. It seemed natural to get us all together face-to-face," said Andrea. So they organized their first meet up at Brassaii Bistro, who had been tweeting about the opening of its well-loved patio last May. With the success of their first meet up they have since organized a tutored wine tasting of Ontario wines at Cafe Taste in Parkdale, a miracle fruit tasting party, and a bus winery tour of Prince Edward County. For Christmas they decided to host a fundraiser, and the Bake Off was born. The bake off benefited The Stop Community Food Centre, a food bank and advocacy group with an innovative mix of community outreach programs designed to help Torontonians become more engaged in the food they eat. For a crowd of over 100, the FoodieMeet Bake Off offered up a serious selection of delicious baked goods, raffle prizes any foodie would be thrilled to get, and a little booze thrown in for good cheer. Even though the selection was a little cupcake- and bacon-heavy, my personal favourite indulgences of the evening included the Tandoori Shortbread Tarts with Passionfruit Curd (so creative!! 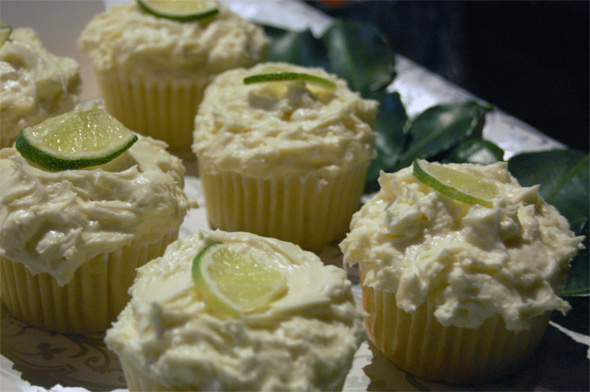 ), the Coconut Cupcakes with Kaffir Lime Icing (so moist!! 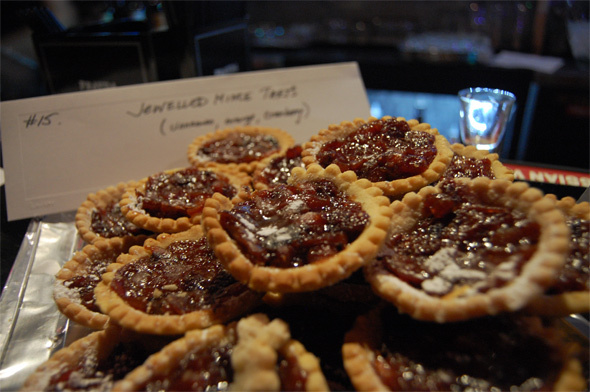 ), the Jeweled Mince Tarts (so Christmas-y!!) and the True North Strong and Frees (a combination of maple and bacon on shortbread; so Canadian!!). Once again, an interesting group spawned on the pages of Twitter, and has put on an equally interesting event. 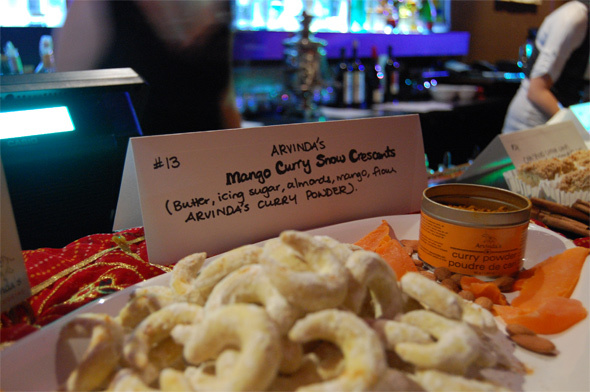 While I continue to come down from my sugar high, you can check out @foodiemeet for TO food tweeting and upcoming events.